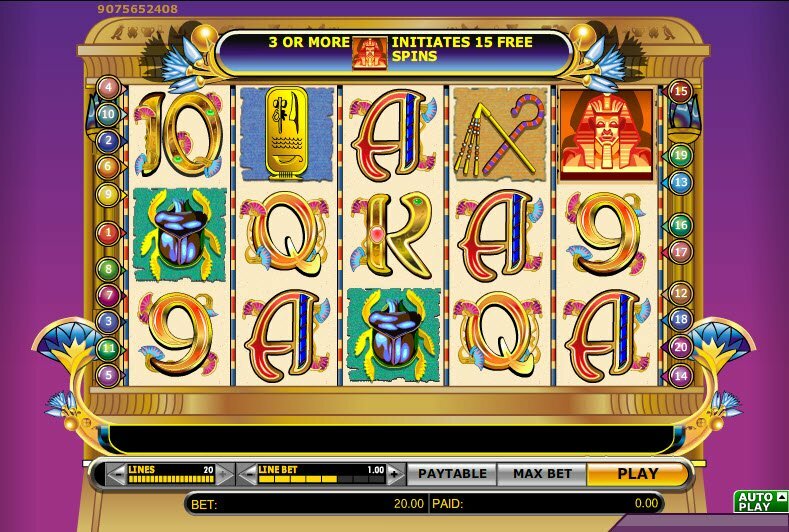 It seems every online casino at least features one or two slot machines with an Ancient Egyptian theme. Although Cleopatra’s Slot Game may not represent the best example, this game still has some pretty good bonus features and a fun gaming atmosphere. The reigning Queen of the Nile invites you to play Cleopatra’s Slot Machine for a chance to win the riches of Ancient Egypt. Play the game for real-money or for free. 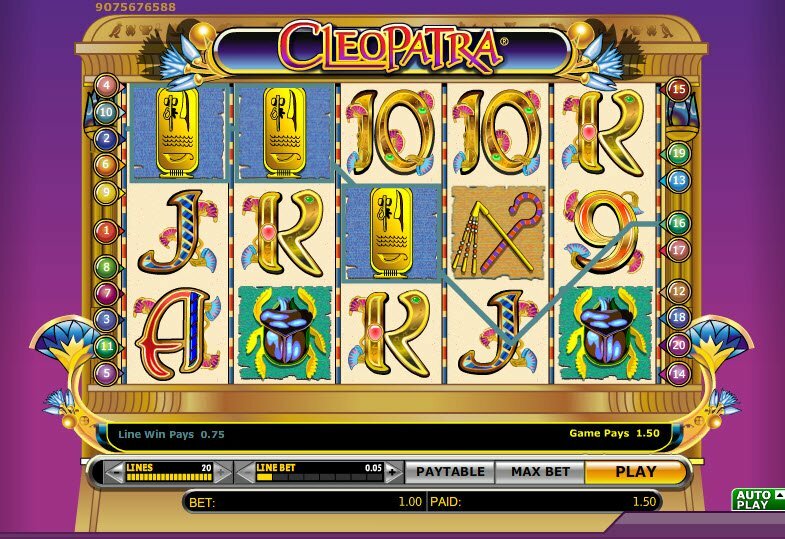 The Cleopatra Slot Game features 5 reels and 20 paylines. Her Sphinx scatter awards Free Spins that triple payouts. Her exotic beauty captivated the most powerful men in the world. Now you can experience the mystical intrigue of the Egyptian Empire’s last Queen with Cleopatra’s Slot Machine. Spin the reels and you’ll step back through the sands of time. See images of lotus blossoms, cartouches, scarabs, the Eyes of Horus and the Sphinx glide across the screen. Listen as the Egyptian table drum accompanies the spinning reels. Unfortunately, the graphic quality just isn’t that great, but at least the game has a pretty cool atmosphere overall. Spin the reels and you’ll step back through the sands of time. See images of lotus blossoms, cartouches, scarabs, the Eyes of Horus and the Sphinx glide across the screen. Although the Cleopatra Slot Machine doesn’t have any bonus games, the slot game still has special features to increase earnings and keep you entertained. For example, The Eyes of Cleopatra substitute for all symbols except the Sphinx and doubles their payouts. 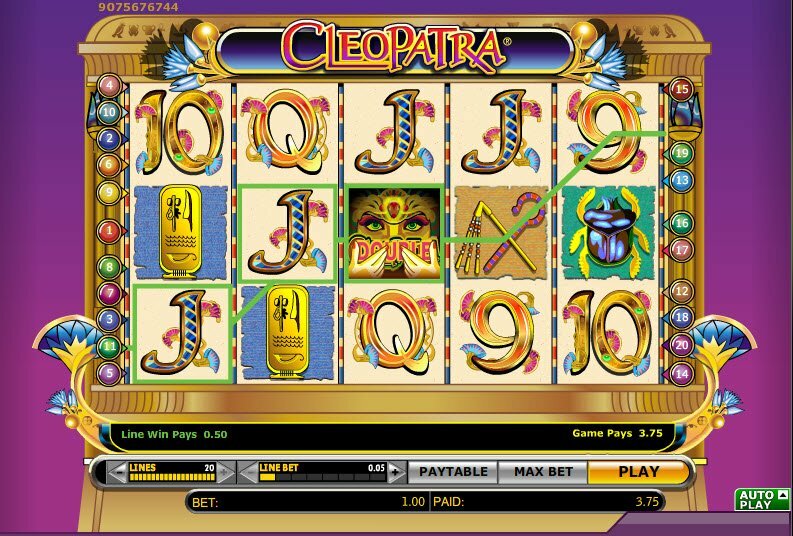 If 3, 4, or 5 of the Sphinx icon appears in any position on the reels, the Cleopatra Slot Bonus triggers. The Cleopatra Bonus awards the normal Scatter pay along with 15 Free Spins. During the 15 Free Spins, all pays triple. During the Free Spins, you can even receive additional Free Spins. - thanks for the review!